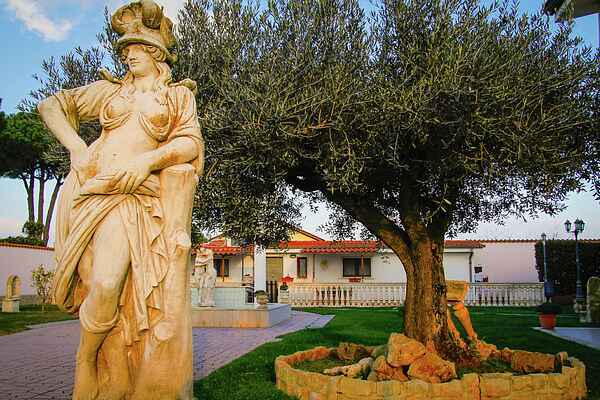 Villa Acropolis is a very special villa with pool in classical style located in the Anzio countryside and its well known seaside resort located in the south of Rome. Villa Acropolis is equipped with a host of amenities and is equipped to provide maximum relaxation to its guests, the villa is ideal for family gatherings or groups up to 26 people, in fact, the structure consists of a large central building, 2 fully equipped cottage and independent of one another, an outside building that serves as a professional kitchen with pizza oven and a grill to cook and eat together, and another external structure that serves as a games room, cinema room and disco. The villa is located on a very large surface area it is in fact surrounded by a 2000 m² garden, ideal for playing outside walking or just to chill out and relax. At the centre of the garden there is a very beautiful scenographic pool with water features ideal to enjoy during the hot summer days. Anzio with its beaches just 5 km away is located at a strategic distance from Rome, point of interest is the Archaeological Museum and the Imperial Villa of Nero, very close, only 18 km, there is the Zoomarine water park.